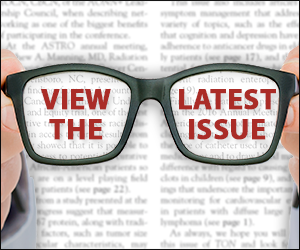 Dr Matthew Goetz addresses common questions that arise when patients with HER+ metastatic breast cancer have progressed on a CDK4/6 inhibitor plus an aromatase inhibitor. Dr Matthew Goetz believes that, as more mature data come into existence, the demonstration of a survival advantage will guide more patients with metastatic breast cancer to try CDK4/6 inhibitors plus aromatase inhibitors instead of chemotherapy. 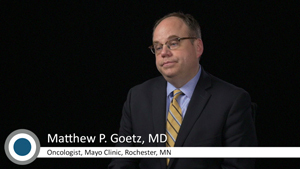 Dr Matthew Goetz explains the rationale for using CDK4/6 inhibitors in patients with HR-positive metastatic breast cancer. The new oral selective estrogen receptor degrader (SERD) elacestrant demonstrates potent antitumor activity in in vitro models, with additive effects to CDK4/6 inhibitors. CDK6 may be a useful biomarker in patients with estrogen receptor–positive breast cancer who develop acquired resistance to CDK4/6 inhibitors, and inhibition of the PI3K/Akt/mTOR pathway may be a reasonable therapeutic approach for these patients. An underlying mechanism of combined endocrine therapy and CDK4/6 inhibitor resistance in hormone receptor–positive breast cancer is senescent escape, and 2 novel therapeutic strategies have been identified for this disease, including MDM2 inhibition and CDK2 activation. Although there are currently no biomarkers to guide the use of CDK4/6 inhibitors for estrogen receptor (ER)-positive breast cancer, markers of mismatch repair dysregulation could identify patients in whom CDK4/6 inhibition may prevent disease recurrence most effectively. The phase 1b trial of the insulin-like growth factor ligand-neutralizing antibody xentuzumab and the CDK4/6 inhibitor abemaciclib, plus endocrine therapy, is designed to evaluate safety, tolerability, and preliminary efficacy in patients with locally advanced or metastatic hormone receptor (HR)-positive/HER2-negative breast cancer. Dr Matthew Goetz addresses the prospect of utilizing CDK4/6 inhibitors to treat patients with HER2+ metastatic breast cancer, stating early data indicate that CDK4/6 inhibitors may have some antitumor activity in HER2+ breast cancer. Despite international guidelines and data that show CDK4/6 inhibitors plus aromatase inhibitors can improve overall response rates, overall survival, and progression-free survival in patients with metastatic breast cancer, there is a lasting belief among patients that chemotherapy is the preferable course of treatment. 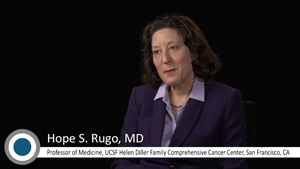 Dr. Hope Rugo attempts to dispel this misconception, citing that endocrine therapy and CDK4/6 inhibitors are well tolerated and don’t have the intensive side effects associated with chemotherapy.